INDIANAPOLIS (AP) — Chuck Pagano wanted one more win as Indianapolis Colts coach. Now Pagano must wait to see if it will be his final victory with the team. 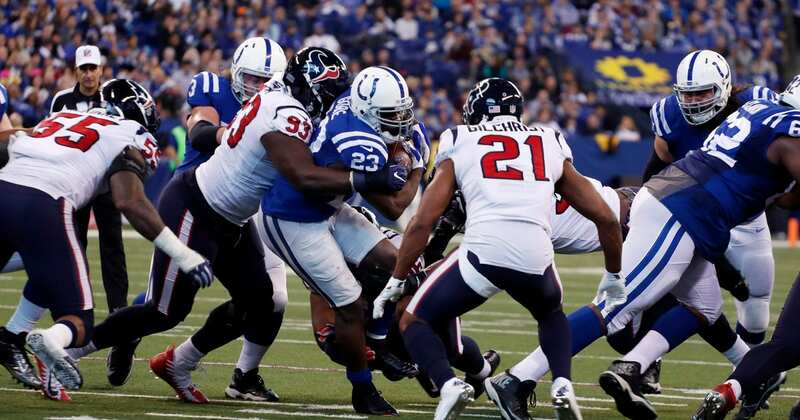 Jacoby Brissett threw for one touchdown and Marlon Mack ran for another as the Colts beat Houston 22-13 in the season finale for both teams. The win ended the longest losing streak of Pagano’s six seasons. It did nothing to quell speculation whether he’ll be back next season, which has been the hottest topic in town since the Colts (4-12) were eliminated from the playoffs for the third consecutive season. Pagano has two years left on his contract. Houston’s plight has been just as bad. The Texans (4-12) lost their last six, nine of their last 10, finished last in the AFC South, and can’t even take solace in draft picks because they don’t own one in either the first or second round in 2018. A dull season finale did nothing to bolster the argument to keep Pagano or Texans coach Bill O’Brien, who also has been under fire. Both coaches tried, and failed, on surprise onside kicks and neither team could consistently move the ball. All the Texans could muster were two long first-half field goals and a 2-yard TD run from Alfred Blue in the second quarter to help them build a 13-7 halftime lead. The offense even gave away points early in the fourth period when Hassan Ridgeway sacked T.J. Yates in the end zone for a safety. Adam Vinatieri made field goals from 54 and 22 yards in the fourth quarter. After one play ended early in the third quarter, the two got into a pushing and shoving match, and at least one punch appeared to be thrown. The officials called offsetting personal fouls, but nobody was ejected. Indy finished the drive with Mack’s TD run. Frank Gore needed 139 yards rushing for his second straight 1,000 yard season. The Colts gave him a steady diet of carries, and when he limped off the field early in the fourth quarter after a short run, the fans gave him a rousing ovation. He returned later and finished with 24 carries for 100 yards. But at age 34 and in the final year of his current contract, the Colts clearly wanted to give him a fond farewell — if he’s not back in Indy next season. Texans: Receiver DeAndre Hopkins (calf) missed the first game of his NFL career, leaving four catches short of his second 100-reception season. Houston took another hit when receiver Will Fuller V departed with a left knee injury on the Texans’ first offensive series. Fuller did not return. Linebacker Jelani Jenkins left with a hamstring injury in the third quarter and did not return.